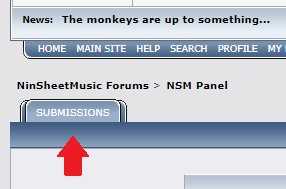 How exactly do you post an arrangement on NinSheetMusic? I'm very new here and I have no idea how the system of posting arrangements works. Is there just an upload area or do they have to undergo a submission process? Or something completely different? Re: How exactly do you post an arrangement on NinSheetMusic? Prepare yourself for a demonstration... in picture form! Go to this area and fill out the information. From there, you'll need a .mus file (Finale/Finale Notepad) a MIDI file, and a PDF file for submitting (a .musx file exported from Finale can also be added). Any other questions, and we'll gladly answer them! The place to share your arrangements with everyone is the piano arrangements board. This is where most members keep a list of all their piano arrangements for people to browse. Also it allows other users to offer feedback on other's arrangements, which is particularly helpful when starting out. For an arrangement to make it onto the main site, it has to undergo a submission process which is all handled in the submission center board which Levi has already given you some handy pictures of. Be sure to look through The Formatting Guidelines before submitting to make sure your sheets are up to NSM standard. Additionally, if you're not confident that your arrangements are ready for submission just yet, you can make your very own topic in the Piano Arrangements board for people to leave their feedback and critiques before submitting proper.